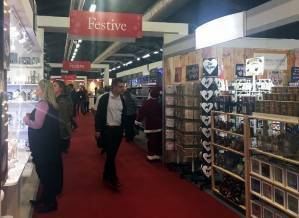 Visitors arriving at Harrogate Christmas & Gift today were greeted with impressive decorations with sparkling lights and eye-catching window displays adorning the entire Harrogate Convention Centre. 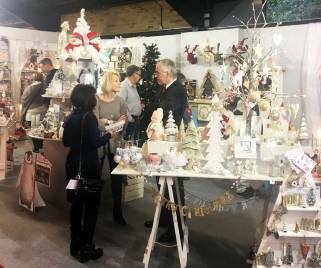 The halls are awash with colour and have been a hive of activity today as buyers perused the dazzling stands packed with everything from cushions and soft furnishings, ornaments and glassware, novelty gifts and toys to flowers, garlands and trees. The glorious smells of cinnamon, citrus and nutmeg emanate throughout the halls thanks to a number of different companies exhibiting spicy wreaths and pine cones and a variety of aromatherapy products throughout the show. There are lots of new product ranges for 2018 including wooden garden furniture from Charles Taylor, greetings cards with LED screens from Really Wild Cards and even tweed and tartan gifts and accessories from Created By The Ridleys. If you didn’t make it to the show today, we hope you can join us tomorrow. The doors are open from 9am until 6pm Monday and Tuesday and 9am until 4pm on Wednesday.